Manila, Philippines- Serving as the Presidential Electoral Tribunal (PET), the Supreme Court has acknowledged many irregularities in the 2016 elections, based on the found evidence during the recount conducted for vice presidential results. Former Senator Ferdinand “Bongbong” Marcos Jr. lost to Leni Robredo by only 263,473 votes. He protested the results and accused Robredo of benefitting from massive electoral fraud. 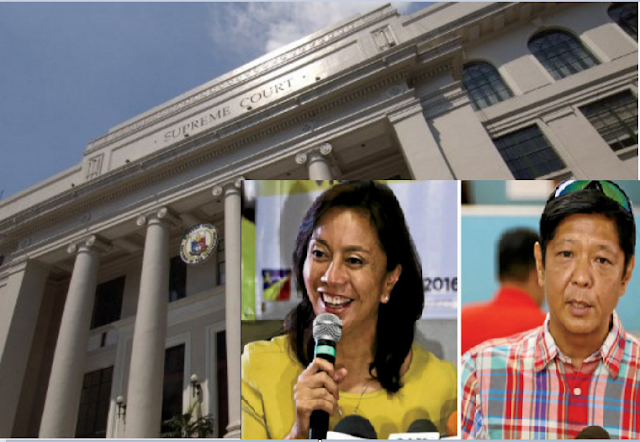 The PET found irregularities in the pilot provinces Camarines Sur and Iloilo that are subject of Marcos’ protest against Robredo. In a resolution of PET dated June 19, 2018, municipal treasurer and a chairman of the Board of Election Inspectors in Camarines Sur were asked for an Incident Report to explain the irregularities found in their ballot boxes. “Note the Incident Report dated May 25, 2018 re: Clustered Precinct No. 36, Brgy. Lupi, Tinambac, Camarines which reads ‘4 black zip ties used to seal ballot box instead of Comelec red plastic seals; plastic seals found inside ballot box, cannot be found; election return envelope not inside ballot box, cannot be found; envelopes for MOV (minutes of voting) and torn ballots appear to have been previously opened; and Voter’s Receipt box is missing; Voter’s Receipts found scattered inside ballot box; Direct the Revision Committee xxxx to continue with the revision of paper ballots; and direct the Municipal Treasurer of Tinambac, Camarines Sur to explain the observations in the subject Incident Report within ten days from notice hereof,” the PET resolution said. The entries in the two MOVs have substantial discrepancies. It cannot be determined with certainty which of the two was actually used or both were used. As for the different signatures of the BEI Chairman in the official ballots, MOVs and envelopes, it cannot be ascertained if signatures were made by the BEI Chairman or signed by different persons; direct the Revision Committee xxxx to continue with the revision of paper ballots and reflect the entries of both MOVs in the Revision Report and direct the Chairperson of the Board of Election Inspectors to explain within ten days from notice hereof why there are two MOVs inside the ballot box,” it added. Aside from the already mentioned anomalies, during the on set of the revision, there were wet ballots found and missing audit logs. Further, In a 9-page Notice, dated April 24, 2018, PET has ordered the municipal treasurers in the towns of Bato, Sagñay, Garchitorena and Ocampo were given 10 days to explain the wet or damaged ballots found in their areas. Because of this, the tribunal suspended the revision of the affected areas showing discrepancies in the ballots counted and the votes casted as indicated in the MOVs.